Bicycling is a boys’ club. There’s no women’s bracket of the Tour de France and it’s a rare sports fan that can name a single female racer. Here in the U.S., men are twice as likely to ride a bike than their female counterparts and, in DC, barely a third of cycling commuters are ladies. So it’s not surprising that bicycle shops ooze testosterone. That’s why Revolution Cycles, a local retailer, is using a laid-back happy hour to make biking more welcoming to women. Katie Knight isn’t just the general manager at Revolution Cycles’ Georgetown location, she’s also an evangelist for its upcoming “Ladies Night” events. At her store, plenty of women work the floor and run the business, but Knight still feels the boys’ club stigma. 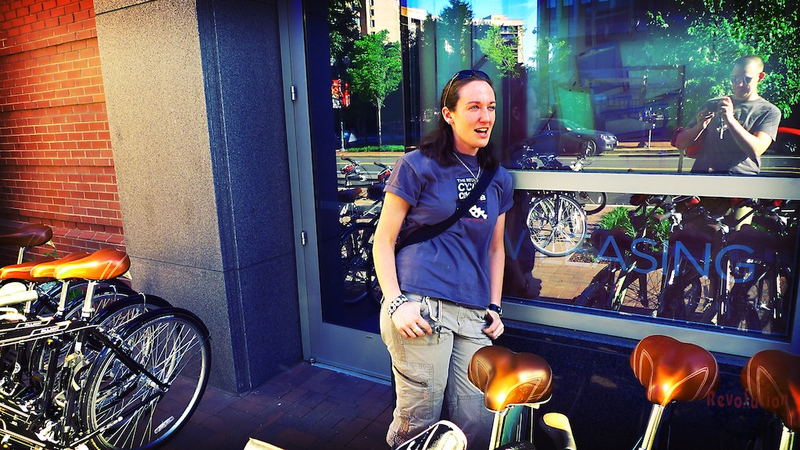 “Women in particular tend to be a little intimidated,” she says of the bike shop. That doesn’t mean they’re not interested in cycling. Riding a bike is one of the best ways to both reduce your carbon footprint (33 percent of U.S. greenhouse gas emissions in 2008 came from transportation) and shrink your waistline (more than 22 percent of DC residents are classified as obese). The reason many women don’t commute or recreate on two wheels is simple: They don’t feel comfortable on a bicycle. Ladies Night aims to change that with a relaxed atmosphere, women-led discussion and, yes, a few glasses of wine. The female-focused event will be hosted at each of the retailers’ five locations, starting Wednesday at 6:30 p.m. in Rockville and wrapping up August 12 at the Georgetown location. At each Ladies Night, women get the basics about buying a bike that caters to female-specific anatomy and tips about what to wear, where to ride, and how to stay safe. But the evening isn’t meant to be a one-way street. Ladies Night is only successful, Knight says, when the lecture is simply a short prelude to mixing, mingling, and meeting other bicycle-curious women. “The point is really informing women, and connecting them to each other as a community of riders,” Knight says. This is awesome! I’m moving to DC in less than a week and I’ll definitely be checking this out when I get there. Thanks so much for bringing this to light, Sacha! I would love to get involved in a project like this- in fact- I just bought a helmet last weekend… I just need to ditch my beach cruiser and get a “real bike” that can manage these hills!